Album number three by a band that could be Sweden's best kept secret! Mean Streak feature a bunch of veteran musicians who have all been in various other projects such as Soilwork, Torchbearer and Unmoored among others and have an incredibly sweet sounding vocalist in Andy La Guerin who croons with the best of them, combining soothing sugary sweet melodic vocals with the ability to pack a punch when called upon. For the most part, the band is happy to stick around the uber melodic middle ground here but they do surprise you with the power and have the abilities to amp it up when called upon! This album is completely infectious and full of insane hooks that just don't let go of you. I dare you to not sing along to such anthems as Shine On, Let Love Rain, A Heartbeat Away, We Are One, etc etc. Then there is tracks such as the powerhouse UDO like Thunderbolt, the haunting vocals of Bad Blood, the beautiful and somber Cast Away, the bluesy intro to Hangman's Daughter and the list goes on. Every single track on this album has something to offer and no two tracks seem to step on each other's feet. The band seems to draw from many different inspirations from Black Sabbath to Journey to 80's hard rock and everything in between! 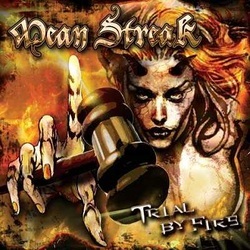 Sweden has long been a home to excellent, melodic metal and now Mean Streak has arrived to put the rest of the bands on notice that they need to step up their game as there will be a Trial By Fire! !